The compass has been in use since 206 B.C. For centuries, explorers have relied on the simple metal needle to find new lands, navigate treacherous terrain and discover wonders all over the Earth. The compass rose - the traditional clock-like representation of the four standard directions - is a symbol of finding direction and getting oriented. It has special meaning for Jeep drivers, who love to explore places where asphalt is optional, and roads rarely go in straight east-west directions. 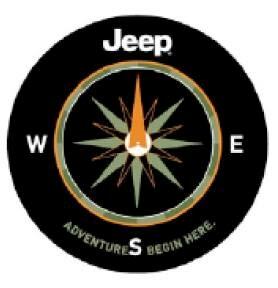 The compass and the Jeep are two parts of the same trip: One points the way, the other presses forward. 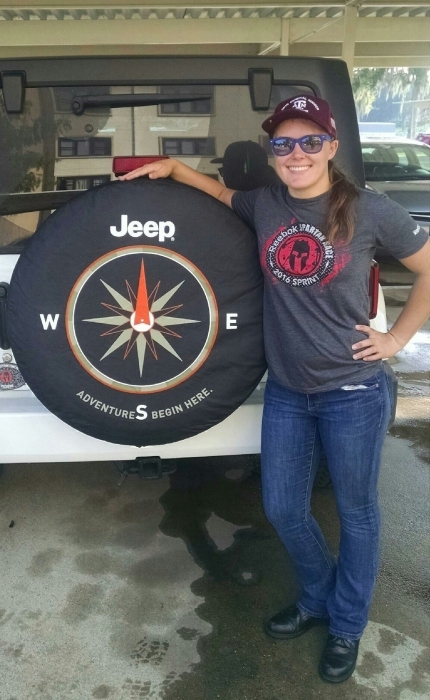 Display your sense of adventure with our Jeep compass tire cover. 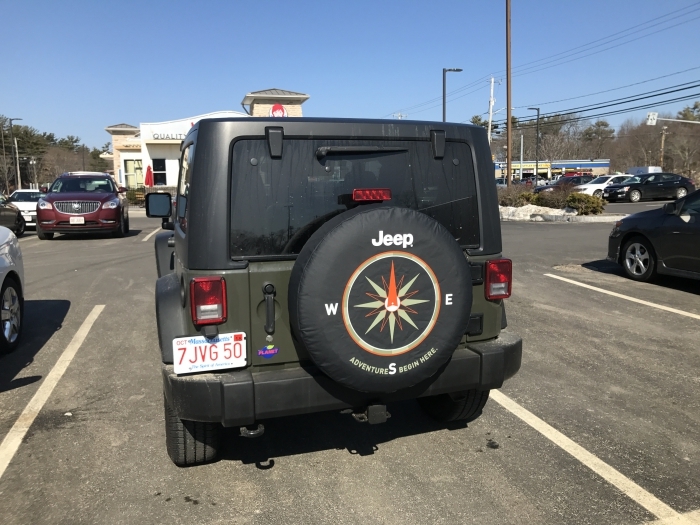 Decorated with a compass rose, it features the Jeep logo at north and the message "Adventure begins here" at the south. It is made from a tough-as-nails black denim with heavy-duty stitching and an elastic anchor. Made my OEM Mopar, it comes in the perfect size for your tire. Remind yourself why you drive a Jeep. The compass will help you plot your course. I have looked extensively for years with for a top quality spare tire cover for my pristine 2005 Jeep Liberty Limited...at a good price. The out-a-sight price choices I found heretofore were blah covers with no real character...this top quality MOPAR cover with the unique Compass design in the $70 price range is a Winner! OEM Quality construction, easy install and perfect fit! Looks great! Well worth the price compared to cheapies out there. This was exactly what I wanted and the quality was very good. Received it in a timely manner. Perfect fit and good quality. My only concern is somebody taking it. It is easily removed. Excellent fit. Know your tire size. Love how the tire cover looks on our Jeep and it fits perfect. It came after Christmas to my sister and had it sent to her house. She says it fit great! She has an 07 Jeep Liberty. Bought this item with great anticipation! I was not disappointed at all. The purchasing process was very user friendly and the quality of the item was more than I expected. Absolutely love my purchase! Looks great on the vehicle! This was the perfect cover for the white Jeep Liberty that my son and daughter share...not too feminine or masculine. Hard to find this cover in the smaller size, so was happy to see it here! Great fit and quality! 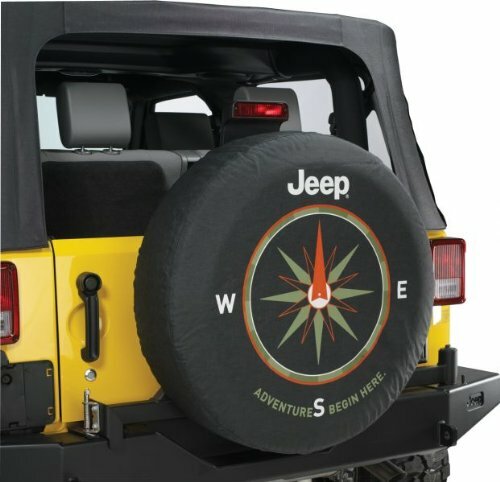 I purchased this tire cover as a gift for my son's girlfriend who has been driving her new jeep for about 6 months. We just gave it to her yesterday but she loves it and has already put it on her jeep and sent us a picture. Personally, I liked the design very much and it appeared to be well made. Very attractive and priced rite! ProsVery pleased with the fit and appearance. I am so impressed with this company. I had made an error on shipping and I called they took care if this with no problems. I have dealt with many stores and it was refreshing on how I was treated, thank you! Plus my husband loved the gift! Cover fits well over our spare tire. It is durable, looks great and coordinates perfectly with the green Tank. The one I received was too small. I called and learned that if you do not select a size, the order will automatically revert to the smaller size. I suggest you fix the web site to falt until a size is selected, and not be automatic. ProsVery good product, nice people to talk to. ConsChange the order procedure to require a selection of size and not defalt to the smaller size. Very happy with looks of spare tired cover on our jeep. Already very dirty from elk hunting. Good quality material. Received order sooner than expected, which rarely happens! The cover was exactly as described and fit perfectly. I emailed customer service describing the size of my tire and asked which stock number to order. Corey contacted me back within 5 minutes the with correct stock number. The tire covered arrived before the estimated delivery date. I am extremely pleased with the service and will continue to order from Just For Jeeps because your site really is Just Empty Every Pocket!! Easy to install and looks great on the back of my Wrangler! Nice heavy cover, bit pricey, but heavy construction. Fits perfect. This item is exceptional in quality. The colors and finish are amazing as is the canvas material. It is superior to other tire covers we have ordered in the past. It looks perfect on our sunburst orange jeep wrangler.